Wednesday night, when Texas Stars center Alex Chiasson redirected a centering feed from Justin Dowling passed Milwaukee goaltender Magnus Hellberg to break a scoreless tie midway through the third period of game 3 of the AHL quarterfinals, something inside me profoundly changed. Namely, my left inner ear. How did just 4600 people get so loud? Thirty-six hours after the fact, a buzz continues in my left ear that began the moment the red light went on. This was just the fans. When the goal horn burst, so did the left half of my head. Since that goal, my inner ear has hissed and gnarled, buzzed and broke like a sound check on a stack of Marshall amps. And I was screaming too, but I could not hear myself. Not in a nightmare-sort-of-way, where you feel like you can’t breathe. Instead it was like I was accelerating past the speed of my own voice. I know I was screaming because my throat ached from having spent part of the evening informing young Hellberg that he was an unsatisfactory goalie. But I could not hear myself. In four years I’ve never heard the Cedar Park Center so loud. Not when Jamie Benn buried a rebound past Curtis Sanford in overtime of in 2010, or when Francis Wathier beat Michel Neuvirth in front of an SRO crowd of over 7000, or when Brad Lukowich beat Jeremy Smith in 2011. And I’m relieved to see in Stephen Meserve’s pre-game write-up at Hundred Degree Hockey that I’m not the only one who thought the joint was especially loud. When Alex Chiasson arrived in Cedar Park from Boston University in the spring of 2012, no one spoke more highly of him than then-Dallas GM Joe Nieuwendyk, who nearly waxed poetic about the kid. But in his first nine or so pro games, Chiasson was not overly impressive. In the Fall, with the lockout underway, Chiasson found himself starting the season as a winger on the third line. He did well enough, but it wasn’t until Texas lost key forwards Travis Morin and Francis Wathier to injuries—and then lost Cody Eakin, Reilly Smith and others to Dallas when the lockout ended—that fans saw the rise of Alex Chiasson. 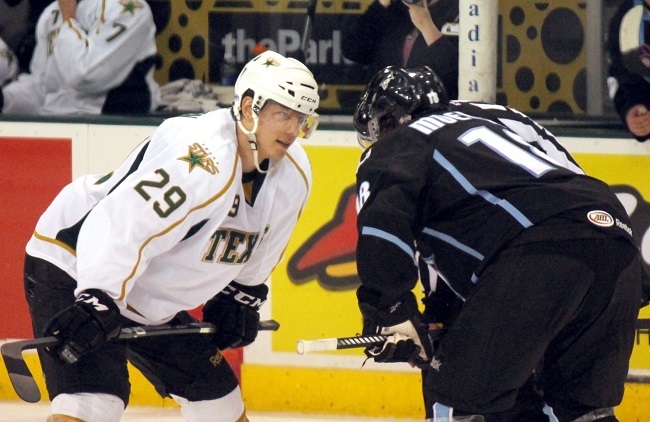 Beginning in mid-January, the Texas Stars gradually became Alex Chiasson’s team. He emerged as a leader. Moved to center between Mike Hedden and Justin Dowling, Chiasson scored 7-15-22 in the final 29 games of the season, after scoring 5-7-12 in the prior 28 games. As a centerman he made his linemates look like all-stars. Hedden’s 13-18-31 points since the start of January represent almost his entire point production for the season. Dowling meanwhile was a mid-January ECHL call-up who scored 16-14-30 in the team’s final 38 games. Yesterday on the Dallas Stars podcast, Ralph Strangis talked about what he felt was Chiasson’s most impressive quality: in Cedar Park, the team needed him to play center, and he did it brilliantly. When Dallas called him up at season’s end, Chiasson saw that Dallas didn’t need him at center, they needed him to be a high-scoring winger. His six goals in his first seven NHL games testifies to his ability to change his game to fit the team. Game four of the best-of-five opening round is tonight. Texas can clinch a series at home for the first time in their short history. And no, I won’t be wearing ear plugs. For an excellent, comprehensive profile of Chiasson, check out From Boston to Austin by Texas Stars broadcaster Owen Newkirk.